The season is the reason ... 'tis the season ... given the date you'd probably think I was talking about the 2009 holiday season, but in terms of fashion that's a distant memory. Nope, I'm referring to the Spring/Summer 2010 colors, and even then I'm late on board. Color is serious business! There are several sources for season color forecasts. Pantone is perhaps the most widely recognized, but after a quick Google search I found a website, Fashion Trend Setter, that summarized the PANTONE Colors and also several other color forecasting fashion sites such as Interfilière and Copenhagen International Fashion Fair (CIFF). On the ten compiled images below, I compare the 10 PANTONE Colors with the closest matching colors from those other two forecasts. The large squares on the left are the PANTONE Colors, the rectangles are CIFF colors, and the small squares are from Interfilière. What amazed me was, although each company forecasts a different number of colors - sometimes several palates of color, was that I could find very similar colors in each. The take-away being that there does truly seem to be international consensus, at least, about the tones and hues of color that will be important in design. Taking these colors, I wanted to write a little about where we can find these colors among the raw materials used in jewelry design. 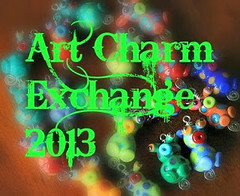 In specific, glass rods for lampworking and semi-precious gemstones, since those are the sources of color I use most. So selfish! Glass rods, generally being more affordable than stones, were more familiar to me so I knew where to look for specific colors. The glass rods shown in the images come from a variety of companies in different coefficients of expansion (COE). Moretti, Effetre, Lauscha, and CiM are COE 104, Bullseye is COE 90, and Glass Alchemy is COE 32-33. These images come from a variety of websites that sell glass including Frantz Art Glass, Lauscha Lady, Glass Alchemy, and Bullseye. I have personally purchased rods from all of these sources except Bullseye, which I purchase at my local glass store, J Ring Glass Studio. Finding matching colors in semi-precious gemstones was a little trickier, primarily because stones are never one single color and some vary more than others. I started by looking at websites with good examples of stones, Fire Mountain Gems, and Holygemstone. I then used Google Images to see how much color variation existed for any given stone. If the color in a stone is relatively consistent, I give you the link for the Google Images result. A semi-precious gemstone with a similar color is Kambaba Jasper. Holygemstone has some Ocean Jasper this color. Holygemstone has some River Jasper this color. Another semi-precious gemstone with a similar color is Bamboo Jasper or some examples of Ocean Jasper. Holygemstone has some Poppy Jasper this color. Fire Mountain Gems has a great selection of Calcite this color. Holygemstone has some Picture Jasper this color. Citrine often has this color. Google Images shows a great variety of Pink Coral, which is a great match for this color. Again, you can see from Google Images that Red Coral, though coming in a variety of hues, often comes in strands this color. Although Amethyst comes is a wide range of hues, you can often find them with this color. Sugilite, an absolutely stunning semi-precious gemstone, also frequently comes in this color. I think that the best match for this color is Lapis Lazuli. 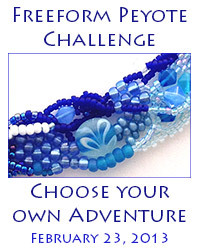 If you're finding strands that are too dark, try looking for Denim Lapis. This is another stone with a lot of color variation. Some is a bright blue, but you can find a lot of true color Turquoise, too. So, if you haven't gotten a start using the new colors yet, and if you actually managed to wade your way through the post, I hope this gives you some good places to start! Yup, today is our 3rd anniversary. That's not normally a bloggable topic except that today, instead of celebrating with my honey, I was teaching a Silk and Stone Necklace class this evening at BeYaGi. Tomorrow, of course, is the Art Show, then Friday we're driving to New Ulm - scheduled as such because I'm supposed to be teaching two classes at Sticks & Stones on Saturday. Doh! Granted, I'm not one of those girls with my anniversary date tattooed to my brain, which is why a class ended up getting scheduled for today. But now that today's here, and the rest of this week's schedule is what it is, part of me wishes I had a little more time for us today. Alas. Okay, so I still need to update the classes, but I have put a new face on the website by revamping the main page. I'm pretty proud of it. It's a little cleaner than the last version and it does a better job of showcasing my work, hopefully providing a better enticement to venture further - giving a little more value to updating the class information. So, if you don't access my blog through the main page of my website, check it out! So, among some of the other tasks that have fallen by the wayside in my adjustment to being a new mom is that I haven't updated my website with the classes I'm teaching or announced the small art show I'm doing October 8th. Today is my Birthday and we're celebrating 27 for the ... something-th time ... making it a good time to reflect on what's happened over the last year. 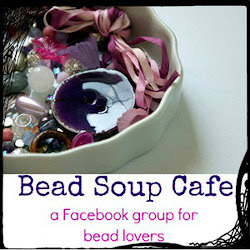 I'm teaching in three stores now - four if you count that Bead Gallery has two locations. The newest place is BiYaGi in Little Canada on Little Canada Road just east of Rice Street. The classes I'm teaching there will be really basic classes in the near future, then building up as the clientelle builds up and the skills of the current clients strengthen. I'm extremely excited about all of that. The more I can teach bead- and jewelry-related classes the more I can be home with Sawyer during the day and not completely let my resume go to crud. I was a substitute teacher for the St. Paul school district last school year, with a long term Social Studies subbing position in February, just before I had Sawyer. I have my first subbing job for this new school year scheduled already, so I'm excited about that, too. The only sticky wicket is that I get paid about what it costs for Sawyer to be in day care, so I'm hoping to find some creative solutions there. It's good for the resume, and all of that, but at the end of the day Sawyer's fomula still costs money if I'm not at home to feed him, so it'd be nice to come out ahead in the financial realm. Being a stay at home mom has been a lot of work, as any stay at home parent knows. The days that Sean has to work late or has Tae Kwon Do (he's a second-degree b lack belt now) get pretty long. Even the days he's home at 6 I'm chomping at the bit for a break by then. That being said, it's hard to imaging letting someone else take care of him. When I was coaching fencing for three weeks this summer my dad, who was one of the many people who got laid off, watched Sawyer for me, but family is a tolerable option. It's sort of a love-hate thing, particularly since I have an at-home business; when I'm at home I feel like I should be working and while watching Sawyer is work of a sort, it's not the kind that results in a happier bank account, but my handsome little boy always wins out. I am waiting for the time when he's a little more independent and I can work more - hopefully keeping the boy occupied by showing him some age-appropriate jewelry-making and fabrication skills. Not a whole lot, really. One little thing is that I made the bridal-party necklaces for my brother-in-law's wedding in July. In the hustle and bustle of last-minute adjustments I forgot to get pictures and will have to see if the photographer got one with a good shot of the jewelry. The bridal party members were all stunning, so it'd be great to have model-like shots for my website. All in all I've had many blessings this year and I'm thankful for each one! I also have additional photos on my Facebook page, which is public. I've been teaching a few classes at the Bead Gallery - despite the fact that I haven't altered my website to demonstrate this - as well as two at Sticks and Stones. In my time at home, during Sawyer's increasingly infrequent and short naps, I have had a chance to make some pretties, with some photos also on Faceobook. Take a look! The little one was due on Tuesday, 10 March 2009, but has decided to extend his stay in my uteris. On Tuesday I was 1cm dilated and 50% effaced, so it seems my body knows something should start happening, yet here I wait. There felt a glimmer of hope on Wednesday/Thursday night. I was having an odd pain that would wake me up now and then, so I thought I was having contractions - a coming-and-going feeling like a back pain that extended around to my front. But come morning, it went away. And, as I'm sure any week-40-pregnant woman will tell you, it almost feels like the baby is gaining a pound a day. Being that I've only gained less than 8 pounds during my entire pregnancy I know that's not the case, but the odd distribution of weight is definately awkward! Anyhow. If Sawyer (we're planning to name him Sawyer Colin Bowen) doesn't arrive by next Tuesday I'll get treated to ultrasound #4, a fetal non-stress test, another exam, then we'll schedule induction. At least there's some manner of end in sight. So, I feel like I've had some excitement in my week; that's something. Wish me luck (and as little pain as possible)!